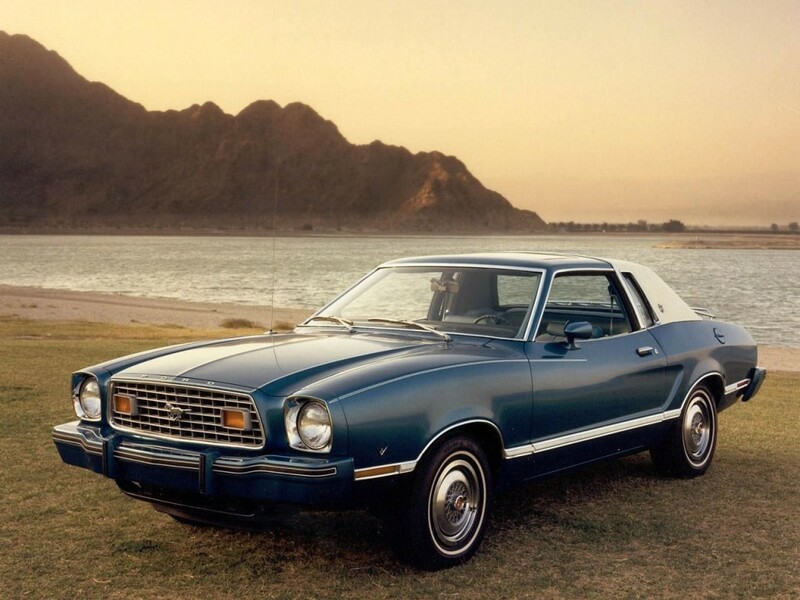 The 1977 Ghia optioned Mustang came with half vinyl roof, pinstripes, unique wheel covers, body side molding, color-keyed interior vinyl inserts and optional Media Velour cloth with large armrests. Medium Gold metallic (also known as Golden Glow) 1977 Mustang with Ghia Luxury Group and the largest Mustang engine offered in 1977, the 134 hp (at 4000 rpm), 302 cubic inch, 5.0 liter, 2 barrel V8 engine. The Ghia Luxury Group included half vinyl roof, hood striping, bodyside moldings, velour cloth interior color-keyed sun visors and headliner, and center console. Ghia was a group of Italian designers which Ford acquired a controlling interest in 1970 who designed the Mustang II models which started in 1974. This car has aftermarket wheels. Bright Aqua Glow Blue 1977 Mustang Ghia coupe with the Ghia half vinyl roof, bumper guards, side molding, sun roof, fog lamps, and wire wheel covers. This car is available in 800x600 pixel wallpaper, 1024x768 pixel wallpaper, and 1280x960 pixel wallpaper. Dark Brown 1977 Mustang Ghia optioned coupe with a 5.0 liter (302ci), 134hp (at 4000rpm), 2 barrel, V8 engine. The 1977 Ghia optioned Mustang came with half vinyl roof, pinstripes, unique wheel covers, body side molding, color-keyed interior vinyl inserts and optional Media Velour cloth with large armrests (which this car has). Restored White 1977 Ghia optioned Mustang II coupe with a green vinyl half roof, color matched side molding, color matched sport mirrors, fog lamps, wire wheel covers, bumper guards, and a 302ci (5.0L) V8 engine. The half vinyl roofs, pinstripes (not on this car), unique wheel covers, and color keyed vinyl insert moldings were part of the 1977 Ghia options group. Light Aqua 1977 Ghia Mustang II coupe with a bright blue leather interior and a white half vinyl top. This car has the big V8 engine under the hood. There is a V8 emblem on the front end fender. See those extra vertical rubber pieces on the bumper? Those are optional Bumper Guards. Does this car look familiar? It should if you have the early 1977 Mustang promotional book, its on the cover. Or at least a similar Polar White 1977 Ghia coupe with a half green vinyl roof. Check out the lace wire type wheels and real wood vernier dash. This car was at the 2010 Mustang Club of America Grand Nationals held in Bellevue, Washington.